The Boulder County Comprehensive Plan (BCCP) was developed to respond to the widely accepted principle that the myriad of future land use decisions affecting the county’s lands should be made in a coordinated and responsible manner. Growth should be channeled to municipalities. Agricultural lands should be protected. Preservation of our environmental and natural resources should be a high priority in making land use decisions. Please see the Boulder County Comprehensive Plan Update for information on the current update review. 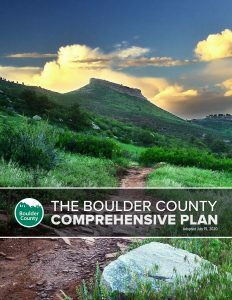 The Land Use Department also has printed copies of the Boulder County Comprehensive Plan available for purchase at the Land Use Department. Editors note: The Boulder County Comprehensive Plan document is undergoing revision. BCCP elements are updated on a rolling basis, one element at a time. For several years, new and updated elements of the BCCP have been posted separately rather than being integrated into a single document. This interim layout version of the plan assembles all currently approved components into a single document while staff prepares a new document design that will ultimately be applied to the entire document and used going forward. The Building Safety & Inspection Services office is closed on Tuesday.